The politics of evil refers to an invocation of evil in political rhetoric against a person or group that, intentionally or otherwise, stifles democratic debate, and can promote hate speech such as George W. Bush’s reference to the “Axis of Evil.” Labelling a group as evil taps into powerful imagery from religion, popular media, and other cultural sources. Drawing from a qualitative study with Grade 11 students and the concept of order-words from Deleuze and Guattari, this chapter examines the power the label of evil has in the context of the study of historical and contemporary events. An earlier version of this chapter was published as: van Kessel, C. (2017). 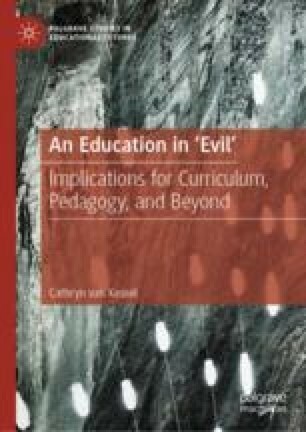 “A Phenomenographic Study of Youth Conceptualizations of Evil: Order-Words and the Politics of Evil,” Canadian Journal of Education, 40(4), 329–355. Anonymous. (n.d.). Why are Muslims so evil? Yahoo Answers. Retrieved from https://ca.answers.yahoo.com/question/index?qid=20120309021220AAH26DR. Bryant, L. R. (2011, February 20). Two types of assemblages. Larval Subjects. Retrieved from https://larvalsubjects.wordpress.com/2011/02/20/two-types-of-assemblages/. Bush, G. W. (2002, January 29). State of the union address. Presidential speeches archive. Charlottesville, VA: Miller Center. Retrieved from https://millercenter.org/the-presidency/presidential-speeches/january-29-2002-state-union-address. Fabello, M. (2013, May 20). Thin privilege [Video web log post]. Retrieved from https://www.youtube.com/watch?v=qPETV_Jw1XU. Marton, F. (1986). Phenomenography: A research approach to investigating different understandings of reality. Journal of Thought, 21, 28–49. Retrieved from http://www.jstor.org/stable/42589189.